Like everything else in business, effectively selling requires a process. 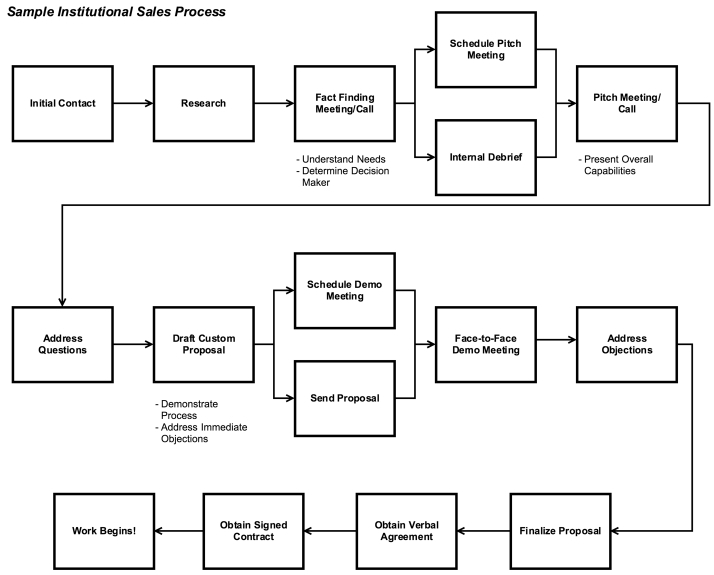 Whether you’re a member of a sales team or an entrepreneur, defining and mastering a systematized sales process is a key element in operating a successful business. The focus of this Trep Tip is on the institutional side– commonly known as B2B (Business to Business) sales. The key to B2B sales is remembering that, despite the name, the process is not one corporate entity selling to another, but two humans trying to find a mutually beneficial solution. Relationships are the cornerstone of effective business, and sales is no different. Due to the number of decision makers, the institutional sales cycle is typically much longer than the retail cycle, providing plenty of time to build substantive one-on-one relationships. Once you have mapped out the problem it is time to craft your pitch. Your pitch should tell the product story and speak to its benefits in a way that is compelling, concise and relevant. Unlike retail sales where the initial point of contact and decision maker are one and the same, there is an additional step in institutional sales— to determine who in an organization you should target. Who has the ability to build consensus and influence a purchase decision within their organization? How can you craft your pitch to resonate with them? Not only does the actual act of process mapping help deepen understanding and establish standard protocols, but the resulting tool can be used to effectively and efficiently train new hires. As a process becomes standardized there is often a fear that it will make actions too rigid. Such concerns are not without merit — potential buyers can tell when they are being treated like just another row in a spreadsheet. The key to avoiding this type of rigidity is not to avoid building process altogether, but to implement a “needs-based” sales approach throughout the entire sales cycle. There are two types of sales approaches — “product-push” and needs based. Product push is based around the features and benefits of a product — and pitching them to as many people as possible with the goal of converting a certain percentage of them into buyers. This approach can work for retail sales, but is considerably less effective for B2B sales. When using a needs-based approach, the seller’s primary focus is to listen to the buyer and understand where they are coming from. You can then frame your offering in a way that speaks to the needs of that particular customer, and potentially even put together a custom solution. The good news is that even if you’re running a company or department by yourself, you’re still not alone. There are a number of software programs that can help you manage your company. For sales, the first purchase should be a Contact Relationship Management (CRM) system. As sales volume increases this type of program becomes vital to keep track of all of your leads. Unless you need a lot of customization, off-the-shelf CRM solutions are more than sufficient and fairly inexpensive. Within a CRM you can establish flows that correspond to your newly transcribed sales process, tracking clients as they move through it. Not only can this help keep track of an individual client, but it also gives managers the ability to evaluate the sales process at a system level. A good way to visualize sales as a system is the sales funnel, with the pool of potential customers narrowing at each level. Your sales process, which we mapped in Step Two, will take leads and advance them through the sales funnel, so the two frameworks should be aligned. 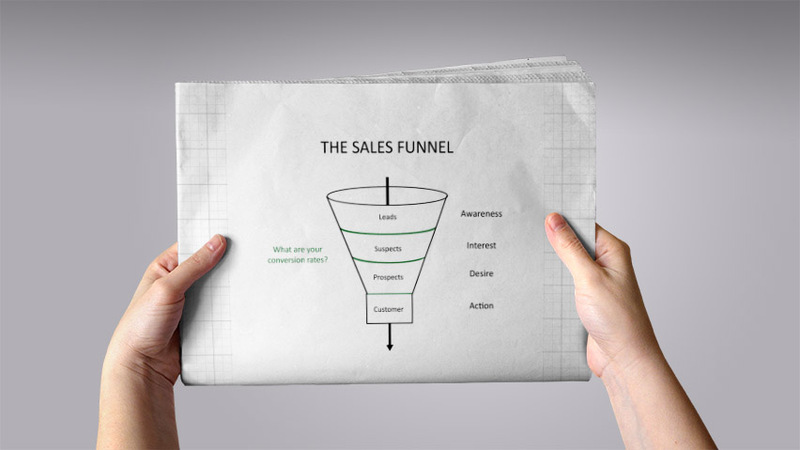 A certain percentage of contacts will advance from one level of the funnel to next. 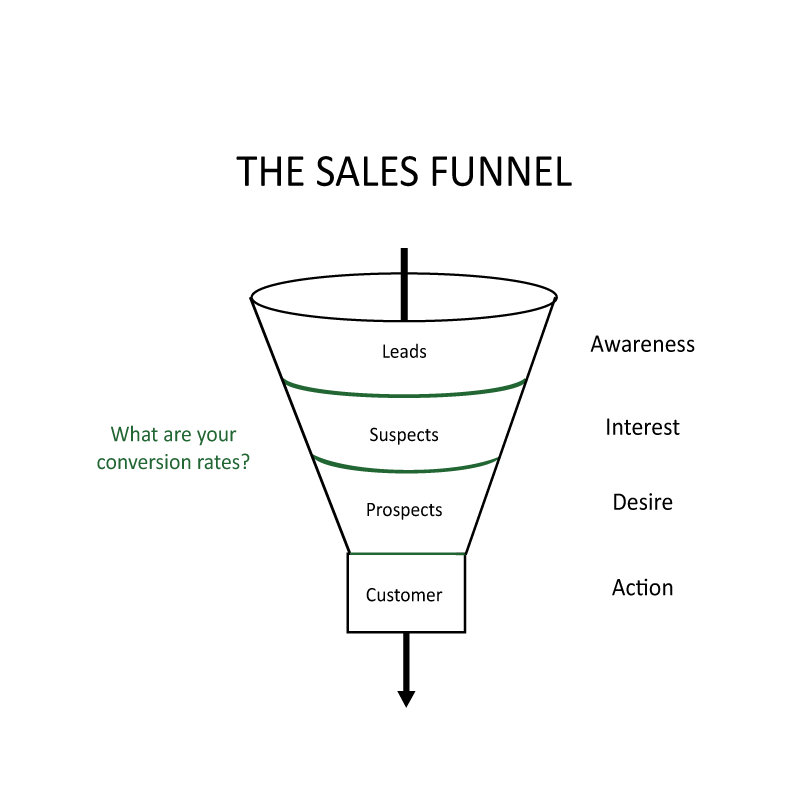 This ‘conversion rate’ can be used to analyze your sales process at a system level — where are you losing the most potential customers and what can you adapt to plug the holes in the funnel? You can also use the software to analyze the effectiveness of individual sales employees, and reward those that are most effective. No sales process is exact, and any processes should and will evolve in tandem with your business. But evolving strategically requires fundamentally understanding your current process. A good start is mapping out your current process. From there you can build your CRM system to fit this process and begin to track sales. At the end of the day always remember that regardless of whether your customer is an individual or a Fortune-500, the reason your product exists is to solve a problem. And as you systematize your sales process make sure to continually deepen your understanding of that problem by using a needs-based sales approach.